The i-viewer magnifiers help shoppers with poor vision. “This is a visionary move by Scotmid by including i-viewer in their customer care program." Scotmid is making shopping in its stores easier for people with poor vision, thanks to a roll-out of i-viewer shelf mounted magnifiers in selected branches. Scotmid is the first retailer in Scotland to install the award winning i-viewer devices, which are designed to help people with sight problems read food labels effectively for ingredients, nutritional content and other information. 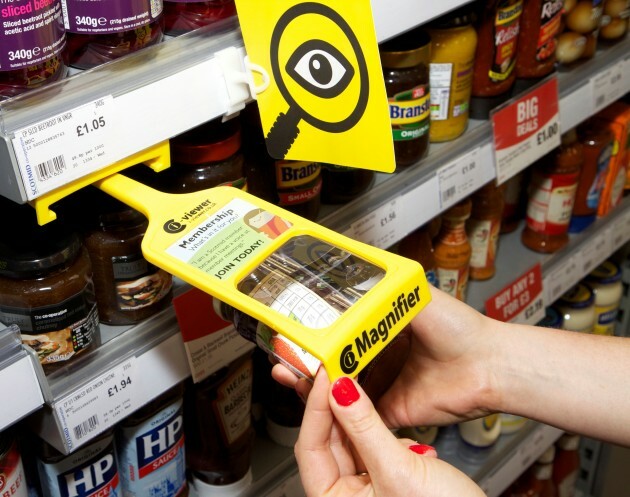 The in-store magnifiers will be vital for people with diabetes who need to check sugar content, as well as people with allergies or on a low-salt or calorie-controlled diet. According to research conducted with the Royal National Institute of Blind People (RNIB), 83 per cent of people surveyed said they had problems with reading small product labels. Additionally, 60 per cent of spectacle wearers said they forgot them regularly when shopping. Scotmid has been trialling the in-store magnifiers in six stores across Edinburgh over the past few months, and will now be installing the devices in seven additional locations following positive feedback from customers, where 75 per cent of those interviewed said they would find i-viewer helpful. The i-viewer fits neatly into the unused part of the shelving above the products and is simply withdrawn from its holder to provide a magnifier at the fingertips of the user. The product to be viewed is simply placed underneath magnifying the information. The i-viewer incorporates a high quality lens with 2 times magnification and a 5 times magnification bubble lens, providing help with reading even the smallest of print. The i-viewers are currently in Scotmid stores at Ratho, Barnton, Balerno, Crewe Road, Ferry Road and Stockbridge, and will be rolled out to Easter Road, St Margarets, Beauly, Coupar Angus, Moredun, Hunterfield, Broxburn and Lazonby over the coming weeks.